Indy treats Palestinian street theatre as real life. The Independent did what it often does when reporting on Israeli removal of illegal, EU funded buildings in Area C (areas of the West Bank under full Israeli control): they illustrated the story with a photo designed to maximize the desired narrative of Palestinian dispossession. 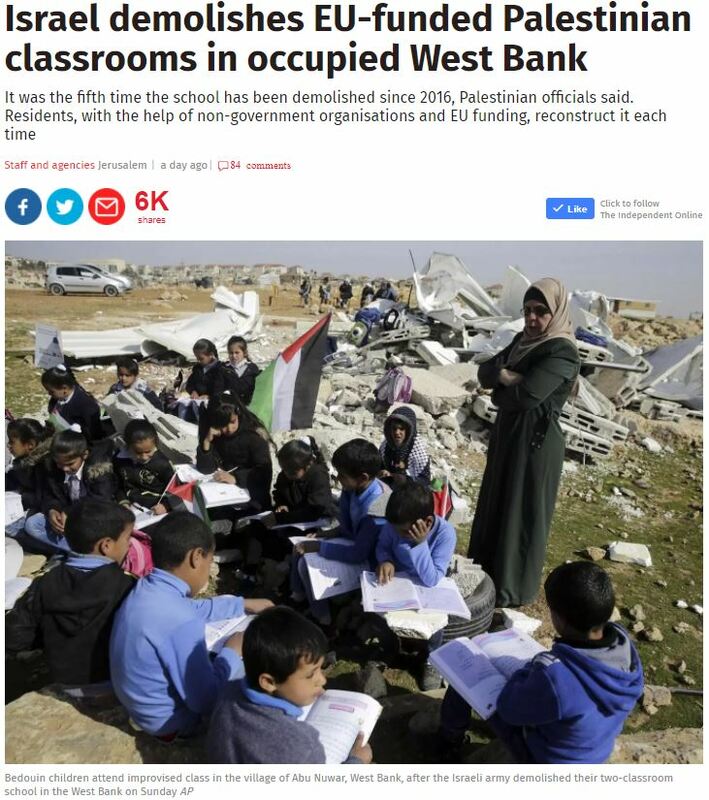 The photo used for the article (Israel demolishes EU-funded Palestinian classrooms in occupied West Bank, Feb. 5) leaves the impression that the demolition of their classroom – funded by the EU in an attempt to create ‘facts on the ground‘ in the contentious E-1 area connecting Ma’ale Adumim with the rest of Jerusalem – forced Palestinians to learn while sitting outside amidst the rubble. Indy editors were clearly aware that the children were moved to nearby facilities to continue classes, but decided not to convey this information to readers. A more accurate photo showing the same children actually learning in the nearby guesthouse wouldn’t have been as evocative. The site depicted in the photo is not their new classroom, but merely a photo-op. The omission of this small detail gets to the heart of the double standards in coverage of the conflict: foreign journalists covering the region are so careful not to amplify or accept at face value the “hasbara” disseminated by the Israeli government or pro-Israel groups, yet seem perfectly willing to report (as real news) such staged protests and other forms of political street theatre. So nice to see how prosperous the Bedouin community is with children wearing smart school uniform. Just think where Israel was 70 years ago. Have you ever asked yourself why the EU had to build the classrooms ? Are you aware of the education situation in East Jerusalem where the municipal govt of the “undivided capital of Israel’ doesn’t provide classrooms for thousands of children as required by law ? The EU should mind its own business. I don’t see it helping poor Jews in Israel. All they do is cause trouble. So the trade in goods between Israel and the EU in 2016 of €*34 Billion just causes trouble and doesn’t help anyone in Israel? That students in Israel can participate in the EUs Erasmus+ scheme just causes trouble and doesn’t help anyone in Israel? That as part of the European Neighbourhood Initiative the EU provides Israel with €2 Million every year for Twinning schemes just causes trouble and doesn’t help anyone in Israel? Since the start of this year Israel has begun to participate in the ‘Open Skies’ Agreement, this also just causes trouble and doesn’t help anyone in Israel? You’re right gary doesn’t the EU cause a lot of trouble, or are you just ignorant of the facts. At the time of writing 1€ is worth 1.22 US Dollars. They reported a Supreme Court decision. Please explain why you believe the City of Jerusalem is allowed to discriminate against children in the undivided capital of Israel? Don’t you think that thus sets a dangerous precedent for when Jews will be a minority in the city? (in about 30 yrs according to the Central Bureau of Statistics, based on current demographic trends). Why on earth couldn’t the EU consult the Israeli authorities about where to build a classroom and cooperate with them, using joint resources, joint knowledge and joint expectations? Why does it have to turn into a PR moment and an excuse for hatred and triumph for the regressive left? Just more disgraceful bigoted dishonesty from The Guardian. Don’t these people have any sense of decency, truthfulness, or self-respect? Errm – it wasn’t The Guardian….. Even though I disagree with most things you post it is nice to see you back again sencar. Sheesh, not the ghastly Sencar back again.